Radon gas has been identified as a carcinogen and has been determined to cause lung cancer. According to the EPA and Surgeon General, exposure to Radon gas is a leading cause of lung cancer second only to smoking. 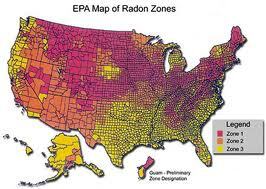 Eastern Iowa inspection services is proud to offer Radon testing to our customers. We perform radon testing in Waverly, Cedar Falls, Waterloo, Cedar Rapids, North Liberty, Iowa City and all surrounding cities. A radon test consists of us coming to the subject property and temporarily installing a continuous radon monitor in the home. This monitor will sample the air in the lowest occupiable level or occupied level ,depending on the type of test, every hour for a period of 48 hours at which time we will return and retrieve the monitor. The data is then uploaded to our laboratory and interpreted for results. The results are put into an easy to read report that is typically delivered to you via email the day the monitor is picked up. Often times, the results are available within hours of the monitor being retrieved. In the state of Iowa Radon gas is very prevalent. Not all homes have Radon in sufficient amounts to warrant the installation of a Radon mitigation system, but all homes have Radon at some detectable level. The Iowa department of public health has produced an informational PDF that has a lot of very good information regarding this subject. Essentially, radon gas is a radio-active gas that infiltrates the home through cracks in the floor, plumbing penetrations, sump pits or other means. The levels of radon gas in the home are dependent on the amount of uranium in the soil under and around the home. This varies greatly from home to home. If high radon levels are detected in the home, a mitigation system may be installed to reduce the levels. A typical mitigation system is not cheap. Therefore, testing is recommended for those involved in real estate transactions as home buyers and sellers will often negotiate the cost if a system is needed. If you tested our home for radon and found it to be high, do you actually install mitigation systems? If so, how experienced are you at these system installations?